Grandfather Alvin D. Todd – What will matter in a hundred years? Thirty years ago, April 27, 1988, Alvin D. Todd died. 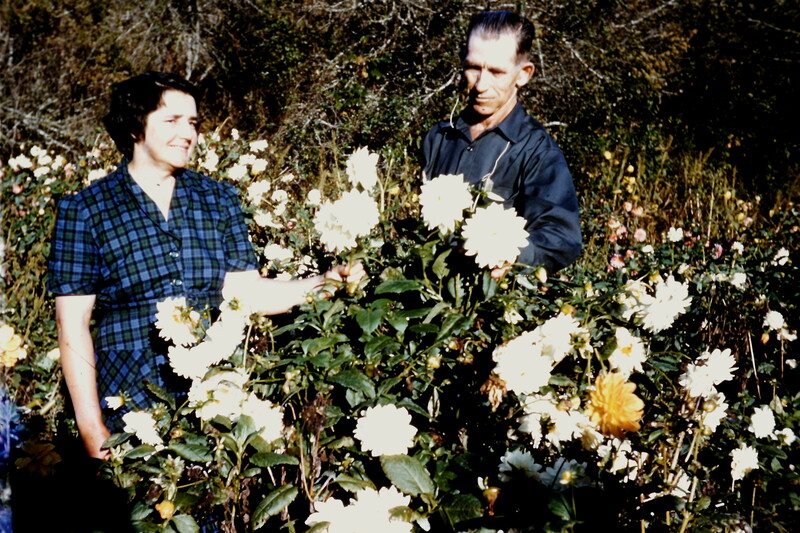 Starting 1929 as a truck farmer in Gaddistown, Georgia, and marketing about 10 varieties of dahlia tubers, gifts from his mother-in-law, the money from which he paid his property taxes, Alvin Todd built a dahlia farming business. By 1970 the dahlia farm, nicknamed â€œLost Hollowâ€, was growing 55,000 dahlia tubers, representing over 500 varieties, that were being shipped to customers all over the U.S.A., Canada, England, Germany, Holland, and Formosa. Of those 500 varieties, 150 were developed, propagated, and named by Alvin. Alvinâ€™s dahlia farm was a family business in which each member, his wife, Zura, and six children, was involved. It was year round work: Spring was spent planting tubers and shipping orders to customers. Summer they worked the crop. Fall they harvested the crop, digging and storing the tubers. Winter they separated the clumps of tubers. Keeping each plant correctly labeled throughout the entire life cycle of the tuber was a very important concern. Marketing the dahlias was a year round endeavor too. Catalogs and price lists were developed and sent to customers; ads were placed in magazines and farm journals like the â€œProgressive Farmerâ€. The farm was open to the public and people came from around the world to tour it and place orders. They had heard about the farm from former customers and from articles in periodicals, travel guides, and newspapers like â€œThe Atlanta Journal/Constitutionâ€œ. Alvin regularly took part in the annual Hiawassee Fair, took tubers to Richsâ€™ Curb Market in Atlanta, and blooms to Lennox Square. By displaying his dahlia blooms along with their labels, people could see exactly what they were ordering. Many of Alvin Toddâ€™s 150 hybridized and named dahlia tubers are still being sold by dahlia farms in the U.S. and Holland. Some of the notables for which he named dahlias were Martha Berry, Byron Herbert Reece, Dr. Louis D. Newton, Herbert Tabor, Mary Lane, Kenneth Rogers, and Betty Talmadge.